David Pendragon's 10-year-old cousin Ryker loves cats. Ryker was overjoyed when he was given a new lunchbox covered with faces of cats. However, when he took his new feline-inspired lunchbox to school, he was teased by other children who thought it wasn't appropriate for a boy. When David heard his young cousin was unwilling to bring his lunch to school for fear of being teased, he decided to take action. 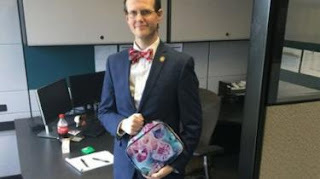 David sourced his very own kitty-covered lunchbox and proudly took it to his "large, conservative, corporate workplace" in North Carolina, US. David shared what had happened in a Facebook post which has been shared 46,000 times and had more than 110,000 reactions. He explains that he decided to stand in solidarity with Ryker to, "show him that a man can love whatever he wants and not be afraid to express that love".